Nava's kryptonite is mobility. We have struggled so much with getting her crawling, Its been the thing that made me the most anxious in the past year. 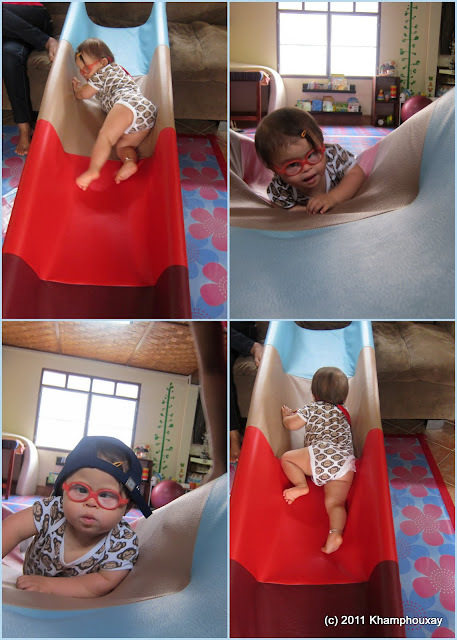 As of 3 months ago, she could belly crawl but would only barely go anywhere-it was pulling teeth to get just 20 or so meters a day (aka not much). She didn't get into things, she wouldn't come to see you on the other side of the room, etc. 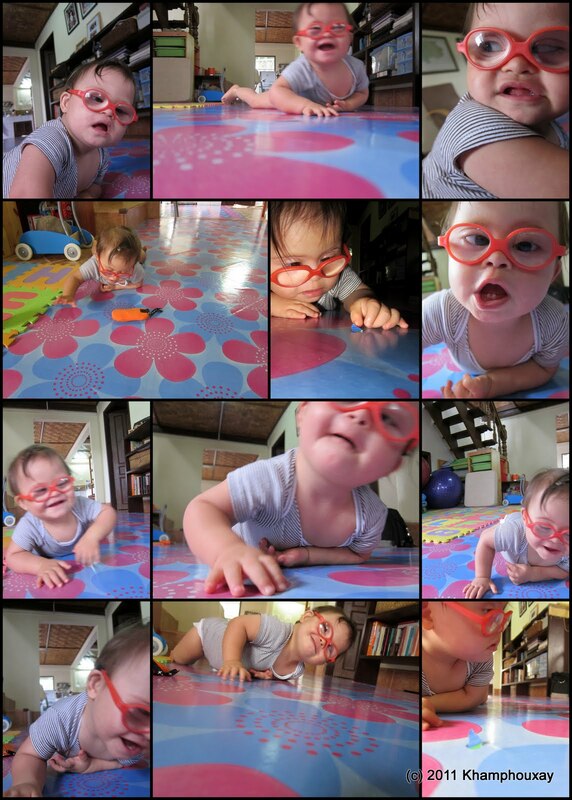 She usually did most of the crawling work with her arms and used her toes to push off but barely bent her legs. For the last 2 months we have devoted ourselves to getting her crawling more. I came back from Singapore with the goal of 150m of belly crawl a day and we covered the house in lino (more slippy for belly crawl) and we did anything and everything to get her moving. We tried to increase the goal by 1 meter per day. We joked that we were going to get track suits that said "coach" on the back from the cousins and put a 'runner's number' on the back of Nava's onesies! And now we're seeing changes. Nava broke 100m about 2 weeks ago. And she broke it with style-like by hitting 104 by only mid-afternoon. It was a sweet day and we celebrated with dinner and frozen yogurt for all of us. A few days later she broke 120m! In the last few weeks we started to not only keep that ever increasing daily goal up but start working on getting her to use her knees (girlfriend is VERY anti-knees). Hopefully this gradually turns into a classic hands and knees crawl. So we did this by introducing obstacles to crawl over and up. First, it was an old couch cushion. Note the bowl of papaya in the pictures above. Bowls of food are probably tied for the #1 motivator for the little miss, tied with towers of stacking cups or blocks. Goong has been known to just grab an empty bowl and tempt Nava into crawling that way (meanie!). And still more challenges were needed (she was getting too good at the above). So I took some leftover wood, foam, and fabric and made custom crawling 'speed bumps' to lay in her way. She immediately decided it would make more sense to just push them out of the way then crawl over them. So I added so gripper mesh and we managed to get her going over. Now she has started climbing up on to the low part of the couch and even has started taking the kitchen and bathroom steps with encouragement. This is HUGE for her. It is a major change and we are enjoying in immensely. At her therapy in Bangkok she charged up the padded steps to the ball pool like a pro and even crawled up the 45 degree incline ramp to the balls too (I'm pretty sure most kids only use it to get out?). Whoa! It's hard though. The reality is Nava is 18 months old and we are cheering her belly crawling. Some kids with DS can walk at this point. Typical kids can walk, run, even kick a ball by this time. But yet, we are soooo happy for her and her progress. It feels weird to hold both ideas in your head at the same time-to know we are no where near 'normal' and yet fully and deeply cherish such huge (baby) achievements. We do though. The pink notecards apparently needed some sorting out. YAY! Bring on the messes and the babyproofing! Oh! I wish you were here to see too! She's changed a lot just since you left...And LOL on the coach handbag! Wow, you are so creative with your therapy 'props!' I completely relate to the bittersweet celebration of milestones. I never realized how much we focus on (particularly physical) milestones as a way to relate to the under-2s. It was so hard for me to see how delayed Pacey was in some ways compared to his peers, but you know what? At age almost 5, no one cares when he sat up, or crawled or walked. Wow you have some great ideas going on there. I love the lino it is so cute! Sandy-I sent my cousin to the store with some money and an order to buy the brightest funnest colored lino they had. Whala!